Other nationalities have always found Americans’ obsession with pearly white teeth unusual but for us, it’s serious business. That’s why it isn’t surprising to see a great variety of dental products and treatments solely dedicated to undoing years of drinking tea, coffee and smoking cigarettes to whiten teeth. Since not many of us have the resources for regular trips to the dentist, home kits for teeth whitening have become very popular over the years. A trip to your local grocery store’s dental care aisle shows this variety of options from whitening toothpaste to whitening gels and many more. One of the cheapest and most effective of these home kits are whitening strips. They are also the easiest ones to use making them a popular choice among adults who desire white teeth. 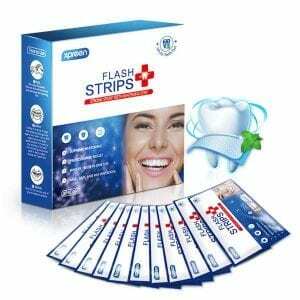 These strips get their effectivity from two ingredients, hydrogen and carbamide peroxide, which are chemicals that bleach the topmost layer of your teeth to get rid of stains that causes the unwanted yellow color which most people find unattractive. If this is the first time that you’re trying out whitening strips, you may want to read our buying guide below to know what factors to consider and which to avoid when purchasing teeth strips. 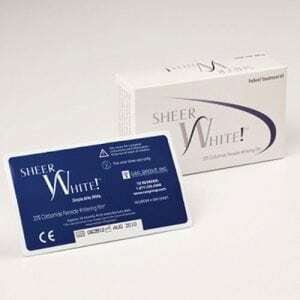 Whitening strips are very easy to use further contributing to their popularity. They usually come in packages of multiple pairs of strips, one for the upper and one for the lower half of your mouth. Each package should come with corresponding instructions for use and recommended the frequency of treatment. Typically, a regular whitening strip kit would require you to (1) remove the strips from their liner and then (2) place the side of the liner with the gel on your teeth making sure to align it to your gum line as well. After this, (3) pat down the strip to stick to your teeth more securely. Finally, (4) fold the excess strip (if there is any) behind your teeth to keep it in place. With the above considerations in mind, we’ve found the best whitening strip products that you can choose from. We’ve ranked them according to their overall rating (from people who have actually used them), general effectivity and easiness to use. Let’s take a more in-depth look at each of these products to see what other things they might have in store for you. 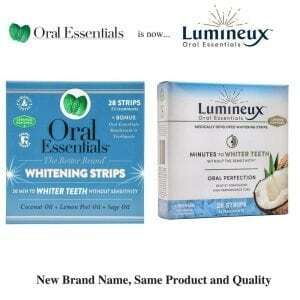 People with sensitive teeth should give the Oral Essentials Whitening Strips a try. With their recent rebranding comes a focus in using natural ingredients for their whitening strips to get rid of the sensitivity that’s associated with using strips the first few times. 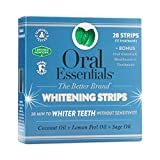 Oral Essentials incorporates ingredients such as Dead Sea salt, sage, coconut oil and lemon peel oil to whiten teeth without the typical harsh chemicals found in traditional bleach-based whitening strips. This natural formula also makes these Oral Essentials Whitening Strips safe to use with porcelain veneers, crowns, and composite bonding. The package comes with 28 strips enough for 14 full treatments. The manufacturer recommends using the product once a day for 30 minutes for each treatment. Crest is a popular and trusted brand of dental hygiene and teeth whitening products so don’t be surprised to find multiple of their whitening strips on our list. 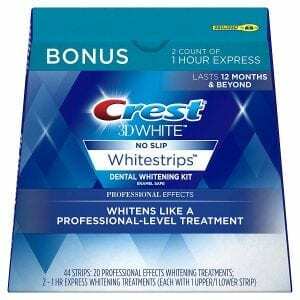 Here we have the Crest Whitestrips Supreme Professional Whitening Strips. It is dubbed to be the most effective of the Crest strips variations given its high hydrogen peroxide content per strip. However, it figures lower in our ranking because it contains 14% hydrogen peroxide in its upper strips which is 4% over than the recommended 10%. Don’t get us wrong though, this Crest product gets the job done well. With regular usage of 30 minutes once a day, you’ll definitely be seeing visible results. It’s also a great deal for its price as each package has 84 strips for 42 treatments. Enjoy professional-quality whitening results for cheap with the Lovely Smile Premium Line of Professional Teeth Whitening Strips. These whitening strips are lauded by consumers for effectively whitening their teeth without the dreaded side effect of tooth sensitivity. Another great thing about these is that they are designed to stay in place with their non-slip feature which is great given that they require you to keep these in for at least an hour per treatment session. The package comes with 28 strips for 14 treatments. If you’re in a rush to whiten your teeth for an upcoming occasion, the Sheer White! 20% Professional Teeth Whitening Strips Kit is your best choice. A warning though, this product has a high peroxide content of 20%. However, this is the exact reason why the product works as fast as it does. The manufacturer promises results after just five days of treatment. Another great thing about this Sheer White! The product is that it easily and securely adheres to the teeth while in use making it possible to stay in place for overnight use as is recommended in the package. Here we have another Crest product. This time it’s the Crest 3D White Whitestrips. 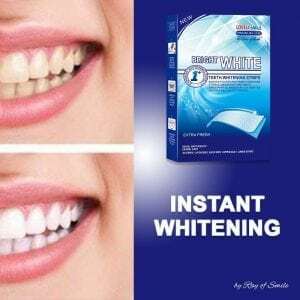 As its name implies, the product is recommended as a supplementary whitening solution to be used in between your main teeth whitening treatment sessions. The product is safe to use as it has the same ingredients present in the products that dentists use in professional teeth whitening treatments. 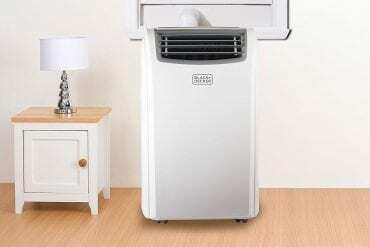 What more, it’s also equipped with a no-slip grip technology to make home treatments comfortable for users. It even allows you to talk and drink water while the strips do their magic. 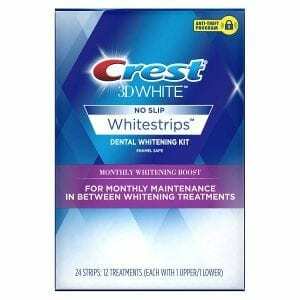 If you want whitened teeth that will last, the Crest 3D White Glamorous White Whitestrips might be your best pick. With an American Dental Association-approved formula, these strips promise to whiten your teeth and keep them that way for up to six months after use. We highly recommend this product for regular wine drinkers and longtime smokers who are looking for ways to remove the stains on their teeth. 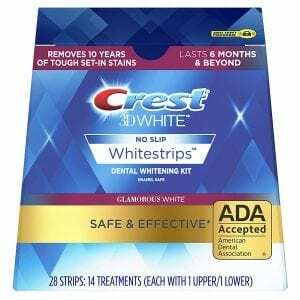 Another great thing about these Crest 3D whitening strips is that they are bendable enough to be shaped according to the mold of the user’s teeth to ensure that they don’t fall or slide off during treatment sessions. Sheer White! is known for delivering results fast and reliable and here’s another proof of it. If you find the previous Sheer White! 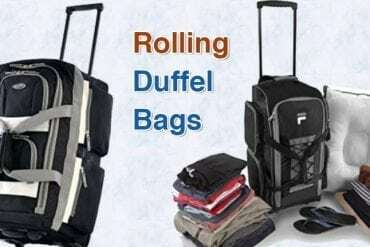 the product on our list a great choice, then you’ll definitely like this one as well. This Sheer White! Strips kit has the same peroxide-rich formula as the other one. Its difference is that it contains twice the amount of strips. The package has 20 strips enough for 10 treatments stretched out in 10 days. Using this, you can expect to see results after just five treatments. 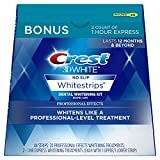 Get rid of up to 14 years of teeth stains with the Crest 3D White Professional Effects Whitestrips. The product promises to express teeth whitening in just an hour each treatment session. What more you will be able to see results after just one session using this strip. Teeth whitening has never been faster and easier. Just peel off the strip, apply to your teeth, let it rest for an hour and see a visibly whiter smile. Another great thing about this Crest 3D product is that has an enamel-safe formula to avoid long-term damage to your teeth. The package comes with 44 strips enough for 22 treatment sessions. Even long-time smokers attest to the Sonimart Advanced Teeth Whitening Strips Kit’s effectivity. Pretty impressive given the fact that Sonimart says that the product has a peroxide-free formula. Thus, we highly recommend this product for people who have sensitive teeth or existing conditions as it’s pretty safe to use. Smokers and coffee drinkers would also benefit greatly from Sonimart’s ability to remove deep-seated teeth stains caused by years of smoking and coffee. 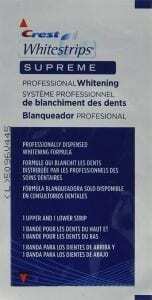 The product has a unique oxygen-activation formula which makes as effective yet safer to use over other strips with peroxide. 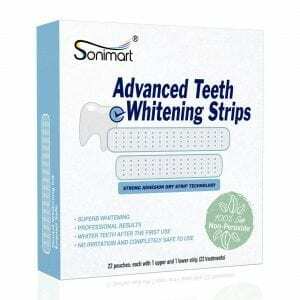 What more, this Sonimart product is also more affordable than brand names retailing for half the price of Crest strips. Topping our list of the best teeth whitening strips is the XPreen Teeth Whitener Professional Whitestrips Kit. 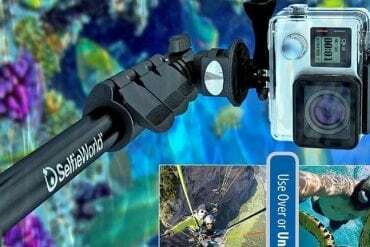 This XPreen product is the best overall choice striking the perfect balance of affordability, effectivity, and easiness of use. 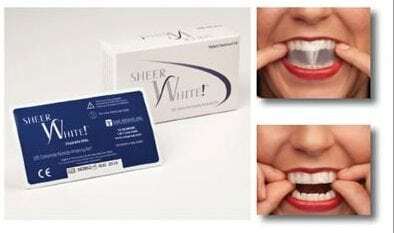 It’s got strong and strips coated with safe and effective bleaching agents which allows users to do other activities while whitening their teeth. What more, the strips are both soft and thin so they’re pretty comfortable to wear for the recommended two hours per treatment session. Another great thing about it is that it’s easy to use, unlike other teeth whitening kits. Just peel off the strip, set it on your teeth, leave it on for two hours and strip it off to see whiter teeth. Your quest to attain whiter teeth shouldn’t jeopardize other aspects of your health. Here are some things you need to know before buying and using a home whitening strip or any whitening kits. What to know about home whitening kits: Not all whitening products you see in the market are safe or effective. And of course, not all whitening products would give you the desired results that you’re looking for. Here are some things to keep in mind. Bleach content: Most strips contain hydrogen peroxide (the same chemical that people use to bleach hair). Given this fact alone, you probably know that it’s a potent chemical. To keep safe, make sure to use products with no more than 10% concentration of bleach. 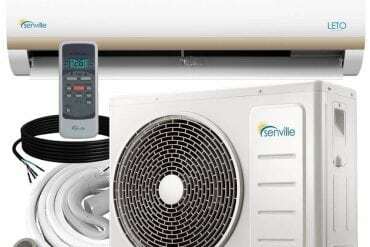 Now, this can be difficult as not all manufacturers include this information in their product’s packaging. If this info is not available, check out if they have any seals of approval from organizations like the American Dental Association (ADA). Strip fit. Whitening strips will be more effective in evenly bleaching your teeth when they fit properly in your mouth. Pick strips that are malleable and bendable so you can make them sit in your teeth better. Remember that most strip treatments require the user to keep the strips in their mouth for at least 30 minutes (some even require overnight use) so you’ll want strips that’ll stay put and aligned with your teeth. You can also choose to buy teeth trays separately to secure your strips more snugly. Check out the ingredient list: Aside from hydrogen peroxide, whitening strips contain other chemicals. Make sure that you aren’t allergic to any of them by checking out what exactly is in your chosen whitening strips. Consult with your dentist: If you have existing dental issues, it’s best if you consult with your dentist first. They might be able to recommend specific brands for your specific needs and teeth condition. If you have sensitive teeth, there are still plenty of options available to you. There are even gentler strips which boast of containing more natural ingredients which they might be able to recommend to you. Who can’t use whitening strips: Most at-home whitening kits and strips are safe to use for anyone with relatively healthy teeth and gums. However, we recommend certain people with the following conditions to refrain from using them. Allergy to peroxide: Since most whitening strips have hydrogen peroxide as the main whitening ingredient, we recommend that those with an allergy to peroxide refrain from using them or at least, get a second opinion from their dentists first. Existing fillings, crowns and other dental restorations: The materials used in these dental work typically don’t react to strips the same way that your teeth will do leading to uneven whitening. Use whitening kits at your own risk. Braces: People with braces shouldn’t use home whitening strips as the strips will only whiten the parts of the teeth the whitening gel can reach. What more, the chemicals in the strips may also cause the metal of the braces to oxidize and change colors. Prescription drugs: The chemicals in whitening strips may not react well with mixing with other drugs. If you have other health conditions which require you to take medicine, make sure to get the approval of your dentist first before using whitening strips to avoid adverse reactions. Possible side effects of using whitening strips: Since whitening strips contain strong chemicals, too frequent and irresponsible use of the product has unwanted side effects that you should watch out for. Tooth sensitivity: This is a typical side effect for first-time users of whitening strips. Experiencing increased tooth sensitivity is normal during the first few times you use strips and typically subsides over time and continuous use of the product. Tooth damage: While tooth sensitivity is a normal side effect of using whitening products for the first time, tooth damage is an undesirable reaction. It usually occurs when the user already has existing dental problems aggravated by using whitening strips. Achieving pearly white teeth shouldn’t be expensive. Using at-home strips is one of the cheapest and most effective ways to get rid of stained and yellow teeth without breaking the bank. 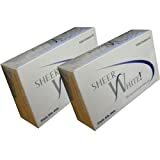 We hope this buying guide and product reviews article has been helpful in your quest to find the best whitening strips that fit both your needs and budget. Just keep our recommendations and guidelines in mind and you’ll be well on your way to getting the perfect white teeth you’ve been wanting.